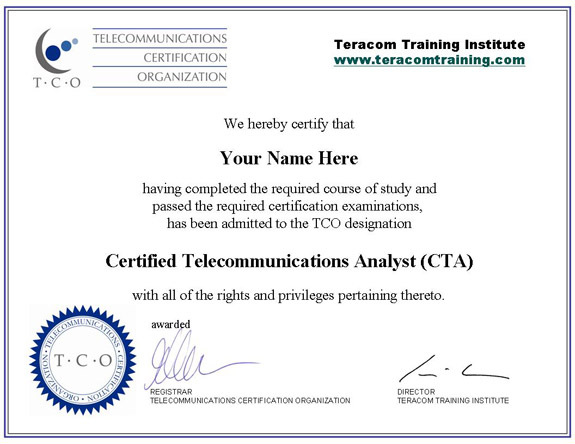 Welcome to the Telecommunications Certification Organization (TCO). TCO provides knowledge skills certification in the areas of telecommunications, VoIP, datacom, networking, IP, MPLS and wireless technologies, and works with training organizations to develop courses for the certifications. TCO Telecommunications Certification confirms and demonstrates that an individual possesses specific knowledge of telecommunications, VoIP, datacom, the network, SIP, IP networking, MPLS and wireless telecommunications technologies. Taking courses to obtain a telecommunications certification is an ideal way to prepare for a job in the telecommunications business. Whether you're a programmer looking for that extra edge to be working for a telecom company, or a sales, finance, marketing, analyst or management person involved with telecommunications, building a broad knowledge of telecommunications networks, services and technologies, and obtaining a certificate to prove it can only help your prospects. For employers, online telecommunications, networking, wireless and VoIP training, covering fundamentals, network technologies and services and current mainstream practices is a highly cost-effective and consistent way to train up new team members - or get your whole department up to a common speed, increasing productivity, accuracy and performance. 4. to award a certificate to a person attesting to the completion of a course of study or the passing of a qualifying examination. 5. Archaic . to assure or inform with certainty. 6. to give assurance; testify; vouch for the validity of something (usually fol. by to ). TCO telecommunications certification is obtained by taking courses and passing qualifying examinations. This has benefits both for individuals and for employers. Individuals may use TCO certification to demonstrate to an employer or potential employer that they have valuable and desirable knowledge skills. TCO testing and certification allows an employer to ensure that their employees, either individually or at a group level, have required knowledge skills. TCO certification may be able to be used as the basis for Continuing Professional Education (CPE) contact hours credits for self-study in telecom, Voice over IP (VoIP), SIP, data communications, TCP/IP, networks and wireless mobile. TCO Certifications are awarded on successful completion of the relevant certification exam, usually following training courses provided by one of our training partners.